The End of "24," "Lost"
NOTE: This entire post is full of SPOILERS. If you haven't seen the end of "24" or "Lost" and ever intend to see either, I suggest you get busy watching instead of reading this dumb blog. Last week marked the end of not one but two significant eras. (Three if you want to count Simon Cowell but let's pretend that "American Idol" isn't the big player in my life that it really is.) "24," my favorite hour long TV show ever, and "Lost," at one time my favorite show ever, both came to a conclusion within 24 hours of each other. This is quite a trying time for me, as you can imagine, so I would appreciate your leniency as I try to fight through this rough patch in my life. (Sympathies may be extended in the form of Whataburger gift cards.) These shows were big parts of my Entertainment Life over the last few years and it seemed only right to pen a goodbye just like about a billion other bloggers have done over the last 10 days. First, "24." When it debuted in 2001, I think most people expected this show to fail. I mean, it was on Fox so the odds of making it out of the first month were pretty low to begin with. The idea of a plot that unfolds in real time was completely unheard of and required a great deal of slack from the network. 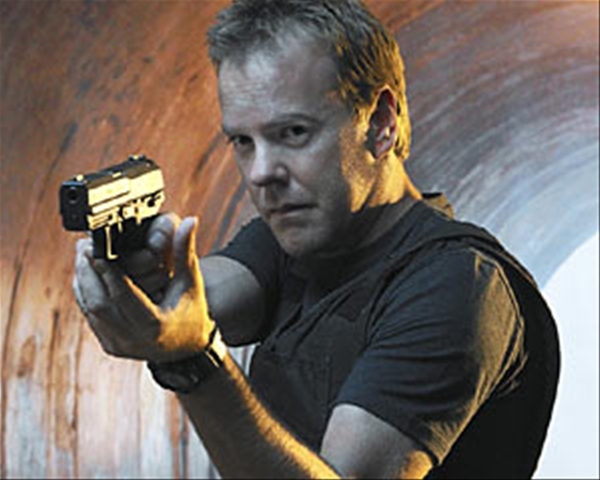 These doubters came up against an unbeatable enemy, however, in the form of Jack Bauer. Jack is an absolute unstoppable force of a character that kicks every other TV action hero in the face. The ultimate flawed good guy, Jack Bauer does only what he thinks is right no matter what the consequence or what must be done to achieve that rightness. Break a bad guy out of prison, shoot a man's wife, or take a bullet himself, it doesn't matter as long as America is safe at the end of the day. And no one, and I genuinely believe this, could pull off Jack like Keifer Sutherland did. His gravel-voice combined with a menacing "I'm Not Afraid to Shoot Your Family if I Think it Will Make You Talk" look are perfectly suited to Jack's no nonsense style. I came to the "24" party late and watched five seasons worth of episodes in about three weeks. I barely stayed awake at work because I would stay up until 3 a.m. watching hour after hour unable to turn the dang thing off. In the entire 8 year run there were hardly any breaks in the action as each hour was just as crazy and suspenseful as the one before. It was all ridiculous and out of control, of course, as we saw several presidential assassinations near completion, multiple nuclear bombs set off on US soil, and a litany of fantastic battle scenes that could never happen in real life. One of my main points of emphasis for a movie or TV show, however, is that the story stays within the boundaries of the reality it has created for itself and "24" does that. By the end of Day 8, you believe that Jack Bauer can do ANYTHING. If he'd started flying at the end of a day or shot Superman-like beams from his eyes, you'd believe it could happen! In my mind Jack's legal middle name is "Freaking" because that's how bad guys should have referred to him. "We have to surrender! That's Jack Freaking Bauer out there!" Day 8 of "24" was by far my favorite. It was the most outlandish, I admit, but hey, if you've stuck with this craziness this far, why not send it off with a bang? This season Jack was completely free to do what he wanted. No CTU, FBI, or Secret Service rules to deal with, just get the job done at whatever cost. He was so single minded and determined as to be reckless and nothing was standing in his way. The dude was just off his leash and if bad guys ever wanted someone on his leash, it's Jack Freaking Bauer. The finale was completely fitting of the man and the show as a whole. Watching Jack run away into the sunset, alone and unattached, was the way "24" had to end. Regardless of any future movie installments, Jack had to be free, had to be on his own, and had to have a purpose (in this case, hiding from the government and Russians). There's no sitting on a porch, playing Bridge, drinking lemonade for Jack Bauer. Ever. He lives the way he did for 8 seasons of this show or he dies. There's no in between. When the ads for "Lost" started popping up in 2004, I thought it looked terrible. The basic idea of the show seems like something that should have been made by Syfy, not ABC. I expected it to be cancelled before three episodes had been aired. For some reason, though, I found myself at home on a Saturday night with nothing to do (because I was too awesome to have plans) and happened to catch a second showing of the pilot. Few shows have gripped me as quickly as "Lost" did. In fact, no show has ever grabbed hold of my attention the way this one did. I was pretty well obsessed from that moment on and could hardly stand to wait a week (or Lord forbid, a summer) to find out what was going to happen next. The writing for "Lost's" early years is some of the best I have ever seen in a TV show. The characters struggling, bonding, and fighting together reflected humanity in a way that I personally find completely unique. Jack, Kate, Sawyer, Sayid, Hurley, Locke, etc. etc. were people that you could gravitate toward and latch on to. And the actors, to a man, brought their A-games to their roles. For all its magnificence early on, however, "Lost" went through several rough patches. Season 3 started and finished well but in the middle you could feel the writers spinning their wheels, unsure of how to dig themselves out of the holes they wrote themselves into. With an end date in sight, Season 4 returned the show to its former glory and, in my opinion, made up for its mistakes. Season 5, though, nearly ruined the entire experience for me. The story arcs, the time travel, and the failure to answer any questions brought me close to the point of quiting entirely. If I hadn't already invested four years of my life, I would have been out. The real problem, though, didn't really hit me until the middle of Season 6 (and maybe not entirely until the finale). At some point, the writers became obsessed with asking questions, with creating water cooler talk. In that, they lost the humanity of the show and of the characters therein. The actors themselves didn't seem to really care anymore. (Matthew Fox especially was in total mail-it-in mode for the better part of three years.) The last half of this season, and the finale in particular, brought all of that back. Jack and company were allowed to be the main focus of the show and again they shined. As the finale drew to an end and one by one the group reunited, I was reminded of why I loved this show in the first place. I was emotionally reconnected to those characters, those people, as I had been before all the time travel foolishness. I loved that the characters were brought back together to go into the Afterlife and personally I loved that Ben was on the outside looking in. Ben always needed the island and it made sense that he wouldn't be ready to let it go. While I certainly didn't get all the answers I wanted, I felt that, like "24," the wrap up was a fitting end. While there have already been attempts to recapture the magic of "24" or "Lost," (especially "Lost") all have fallen far short of the yard stick used to measure the impact of these champions. (Just look at "Flash Forward.") The truth is, both of these shows will never, ever, be duplicated (at least not with any success). They are the best, most unique shows the last decade had to offer and at least one writer will sorely miss their presence come January. A whole hearted "thanks" to the people behind both shows for the hours upon hours of entertainment, speculation, and even the frustration that you have provided over the years.